The recent trend is to sell gold jewelry to make money, instead of stocks. This is due to the sudden rise in the price of gold. But before deciding to sell gold for cash, you need to be aware of certain factors. Only these factors can ensure you whether you can get the right value for the gold you have or not. The Scales Used to Measure Gold: Three main types of scales are used to weigh gold. The “Troy ounce”, “grams per ounce”, and “pennyweight (dwt)”. “28 grams/ounce” is the measurement based on United States scales. However, the grams/ounce according to “Troy ounce”, used by jewelers, comes to “31.1 grams/ounce”. In case of “pennyweight (dwt)”, the calculation is “1 pennyweight = 1.555 grams”. This is used by jewelers to measure a “Troy ounce” or grams. Such differences open up an opportunity through which jewelers can pay less than the actual weight of the gold. Knowing which measure a dealer uses, ensures that when you sell gold for cash, you receive the correct amount in cash. What Are Karats? : Karat is a measure of the fineness of the gold alloy, as pure gold has to be mixed with other metals to achieve both the desired color and durability. The “Federal Trade Commission” of the United States, has determined this as “1 Karat = 1/24 of pure gold by weight”. 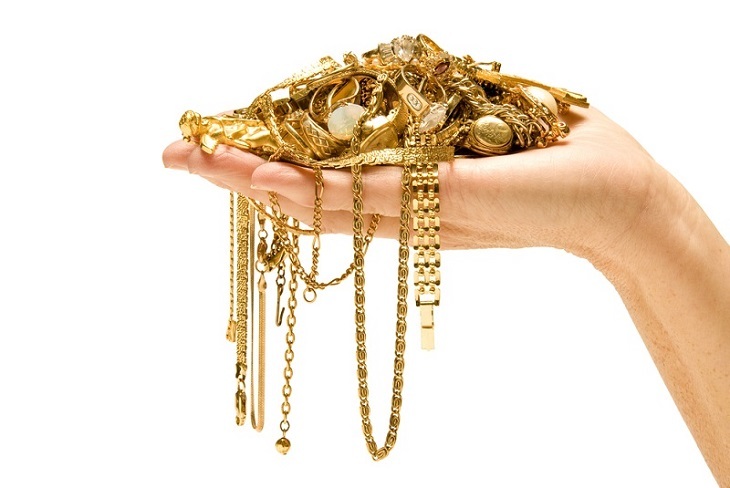 The minimum Karat required for jewelry to be legally categorized as gold jewelry in the United States is 10. Separating Gold Jewelry According to Karat: As gold jewelry does differ according to Karat, it is crucial to categorize it accordingly before you sell gold for cash. Otherwise, the dealer will clump everything together and then weigh it. This can only result in receiving an amount that is far less than the actual value of your gold. The best solution is to get each category weighed separately. Finding Out the Actual Value of All Your Gold Jewelry: Finding out the market price of gold on the day, you are looking to sell your gold, is the safest option. This determines the value you should get once you sell gold for cash. If you go to the dealer after calculating the total value, then you can demand the exact cash amount. Finding Out About Buyers and Dealers: These days information about dealers is available on the Internet on certain official sites. They include an overall summary, reviews, and any complaints that have been made and how these have been handled. Reputable organizations are members of jewelry trade associations. These associations very well ensure high ethical standards. Knowing Exactly What You Have: Gold jewelry can be valuable due to the gold they contain and the designer who designed and made it. For this reason, it is worthwhile to sell them as whole pieces, instead of melting them only for the gold. Getting The Quotes From Different Buyers And Dealers: This gives you an idea of the value of your gold and gold jewelry pieces. It improves your chances of getting a higher value, as quotes can vary if antique or designer pieces are included. Carrying Official Identification That Has Been Issued by The Government: All genuine organizations ask for official ID. They are required by law to do so, to protect customers. Considering Emotional Attachment: As most pieces of jewelry have an emotional connection, it is essential to decide the correct ones to sell. In all cases, the value or amount of cash should be worthwhile. This monetary amount should, as far as possible, never be less than the amount of emotional attachment for the piece(s). For this reason, when you sell gold for cash, it is best to include broken and unusable items. By keeping the above points in mind, you can sell gold for cash and make the transaction worthwhile for you.